Welcome to the Slip Away website. 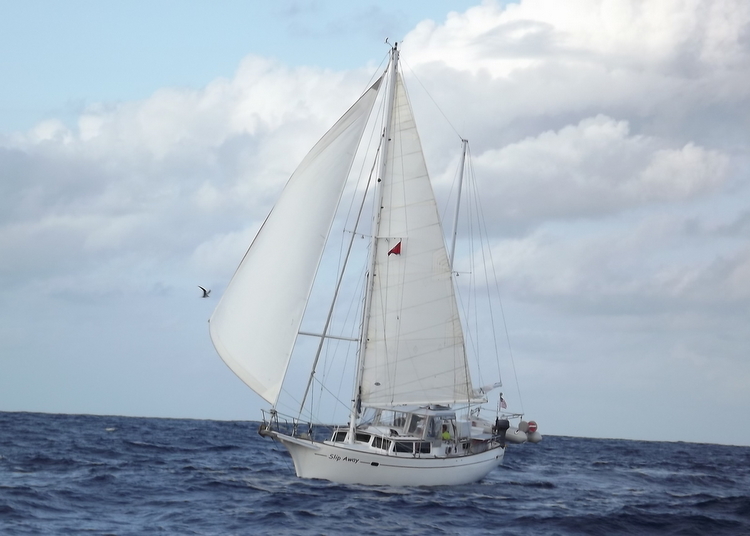 We are Rich Crowell and Jan Schwab, and Slip Away is our 1978 Islander Freeport 41' ketch-rig sailing yacht. We left Los Angeles (Marina del Rey) in 2003 with a long-term plan to spend several years exploring the world. Update for 2019: We made landfall in Richards Bay, South Africa, in late October 2018 after visiting the islands of Cocos Keeling, Rodrigues, Mauritius, Reunion and Madagascar in the Indian Ocean over the previous several months (web page update in the works). In January 2019, we sailed around Cape Agulhas (the southernmost point on the continent of Africa) and entered the Atlantic Ocean. We anticipate leaving Cape Town, South Africa, in late February and our goal is to bring Slip Away back to the USA by late May, completing our circumnavigation. Fingers crossed! We keep a log of our travels and photos on this website. We hope you enjoy it!